Today is the day that a new FULL SIZE oven will be delivered to my flat. I’m pretty excited … still thinking about what to make in it first. All, I know is that we are for sure making dinner tonight and I’m for sure making dessert. But first things first … peanut butter and chocolate hung out in my kitchen last night. The peanut butter mingled with some graham cracker crumbs and even canoodled with some chocolate chips in my summery warm microwave. Next thing you know: a peanut butter cup-esque miracle happened, that Jake didn’t want me to bring to work to share. 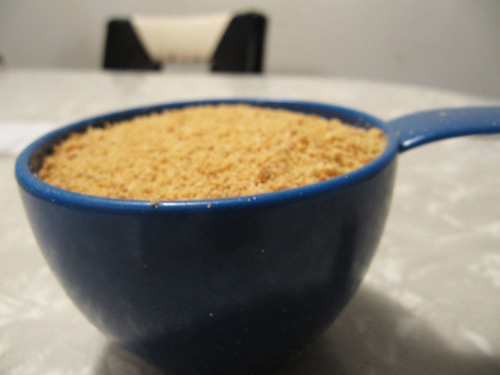 In a medium bowl, mix together the butter, graham cracker crumbs, confectioners’ sugar and 1/2 cup peanut butter until well blended, using an electric mixer or stirring like you mean it. Press evenly into the bottom of an ungreased 8×8 inch pan. 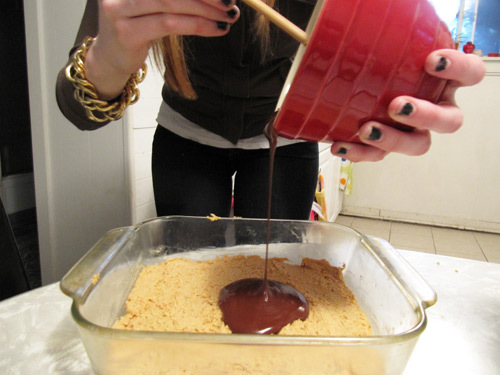 Microwave the chocolate with the remaining 2 tablespoons of peanut butter until smooth. 1 or 2 minutes, stopping every 30 seconds to stir. When smooth pour spread over peanut butter layer. Refrigerate for at least one hour before cutting into squares. METHOD: I usually place the graham crackers in a ziploc bag a few at a time, close the bag, and roll over it with a rolling pin. 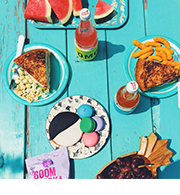 Next thing you know … CRUMBS! 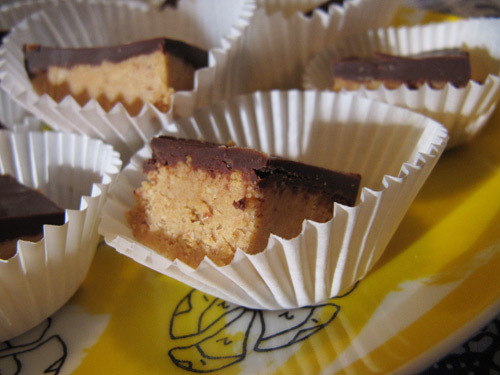 mmmmmmm….chocolate and peanut butter…doesn’t get better than that! Oh my goodness! I used to eat these like crazy in middle school. I had one at least ONCE a day! I had no idea that they were so simple to make?! No doubt, my family would go crazy over these. P.S. I’m feelin’ your super cute cake tattoo. It is gorgeous. Sally! I know man. Peanut butter and chocolate were meant to be. Patty! These are totally a memory for me too. I used to eat them all the time when I was a kid. I’m excited for you to make them! Thanks for the tattoo love! Megan and Sally.. chocolate and peanut butter are two of my all time fav’s.. as are you! And Laura.. and Dan.. OH! And I made Sally’s favorite cookies the other day.. ALSO chocolate and peanut butter!! Hey Mum! Which cookies are Sally’s favorite?! Although I was bummed for you when the oven broke a couple of great things came out of it: 1) new oven — yay! and 2) some awesome no-bake recipes. These look smooth, rich and delicious. I’m going to definitely try them out soon! Totally Beckie! I bet you’ll love these. They are like homemade reeses. A no-bake miracle! These are a combination of all my favourite things ! 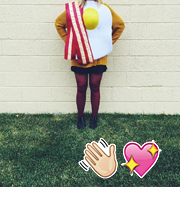 You should totally make these, Louise! I bet you’d love them. Visit Take A Megabite // Megan's profile on Pinterest.